Edwardsville, Metro-East, Riverbend Trial Lawyers | DUI, Criminal and Drug Charges | Polinske & Associates, P.C. Our Edwardsville Law Office Gets Real Results By Taking Action. We have conducted over 100 jury trials throughout the Metro-East. You don't have time to wait, and we care enough to move quickly. Your college student is locked up right now for DUI. You're from out of state and were arrested in the Edwardsville area for drug trafficking. You have been charged with a sexual offense. You're in the middle of a messy divorce and your spouse won't let you see your children. With a winning track record and a reputation for being upfront and honest, we are experienced attorneys capable of handling some of life's most difficult legal matters. You may have never had to deal with something like this before, but we have. Let Polinske & Associates help you right away. Contact our Edwardsville law office today for a FREE consultation to discuss your criminal case, DUI, family law issue, or Illinois traffic violation by calling toll-free at (888) 379-6582. Whether you're facing a misdemeanor or a felony charge, you are probably confused and scared about your future: will you have to serve jail time? Is this a permanent conviction? Will you be fired from your job? The best thing you can do for yourself right now is hire a criminal defense attorney who has tried and won cases like yours before. Polinske & Associates has fought and won all types of criminal cases, including cannabis trafficking, drug possession or manufacturing, assault, domestic battery, white collar crime, disorderly conduct, and violent crimes. As of this date of publishing Brian L. Polinske has conducted over 100 jury trials throughout the Metro-East area in both State and Federal Court. We have also been providing legal defense for students of Southern Illinois University at Edwardsville for over 20 years, working closely with parents, students, and the SIUE police department. We know SIUE students are pursuing a professional career and strive to keep their criminal history clean of any conviction. As one of the top DUI defense law firms in Madison County, our record of winning DUI cases is nearly flawless. We aren't afraid of going to trial, of moving quickly to secure the release of clients from custody, or of filing motions where it's practicable. We know that not all DUIs are created equal in Illinois, and individual circumstances will determine the seriousness of a case and the range of punishments that may be handed down. 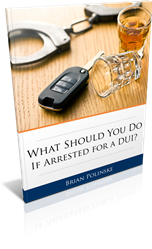 Brian L. Polinske has not lost a DUI trial in his career. Geographically Madison County is situated where both I-55 and I-70 lie. These are two main drug trafficking corridors. Consequently law enforcement targets out of state drivers with their interdiction teams. The teams are run by the DEA, Illinois State police, and other local enforcement groups. Over 85% of all their traffic stops are upon out of state drivers. Vehicles from the east and west coast, Colorado, and other states where cannabis has been legalized are targeted heavily. Mandatory prison time sentences are mandatory for those convicted of trafficking. I specialize in this field and am proud to say that I have never had a client do any prison time for cannabis trafficking. I handle most of those clients charged in Madison County with trafficking. I can assist with bond reductions. Brian Polinske is the attorney who represents clients in these matters. It is always sad when a marriage comes to an end, but Polinske & Associates takes great care in representing our family law clients to ensure they're able to reach an agreement they can live with. We have over 43 years of combined experience representing all types of family clients, including those who need assistance with: divorce, child support, child custody, property division, spousal maintenance, modification, enforcement, mediation, guardianship, paternity, appeals, and even finalizing adoptions. Donna Polinske is the attorney who handles these cases. Police in our area do not tolerate traffic violations of any kind, and if you are caught, you may have to deal with a wide range of penalties. Whether you were driving with a suspended license, no car insurance, were charged with a DUI, or received a ticket for speeding or reckless driving, we will aggressively challenge the ticket to help you keep your license, avoid jail time, and a possible increase in your insurance. We know how important your case is, which is why we always act quickly on your behalf, answer your questions with complete honesty, and make ourselves easily reachable at all times. You're dealing with a serious situation right now and we can assure you that we will do everything we can to help you walk away with a favorable result. We've helped residents from many different Illinois counties, including St. Clair County, Bond County, Macoupin County, Clinton County, Jersey County and Montgomery County. Let us help you, too. Call Polinske & Associates today by calling toll-free at (888) 379-6582. When your life and freedom are on the line, you need an experienced criminal defense lawyer with a solid history of successfully trying cases. Polinske & Associates represents people just like you who are facing potentially life-changing criminal charges. We will work tirelessly to clear your name in cases involving felony drug violations, cannabis trafficking, DUI, domestic battery, white collar crimes, violent crimes, Methamphetamine and Cannabis Trafficking and other criminal acts. If you are charged with the felony offense of Cannabis Delivery in Madison County Illinois you should seek competent counsel. Oftentimes these charges can be dismissed or reduced to a less serious offense. Reduction of bond is your first step. When your release is secured you focus next on the preliminary hearing and arraignment. Then on the discovery and motion practice. I can typically spot whether there are good grounds to win a Motion to Suppress Evidence against the State. In a surprisingly high amount of cases the initial stop and subsequent search are fraught with constitutional issues. Identifying them, filing the appropriate motions and effectively presenting them to the judge are all equally important. Choose competent and experienced counsel to defend you in this situation. Forfeitures of property are becoming more and more common. When arrested for a felony any property that can be connected to the crime's commission may be forfeited by the State. The State's Attorney's Office has prosecutors dedicated solely to this type of action. Don't delay, take immediate action to contest this process. It is an uphill battle, but you can oftentimes prevail. A DUI arrest in Illinois can be terrifying and confusing. How will this affect your future? How can you be found innocent if your BAC was above .08? Attorney Brian Polinske knows how to analyze your case and find possible defenses that could clear your name and help you get your life back. Don't try to fight your traffic violation alone! If convicted, you could face fines, a license suspension, or even jail time. Let Brian Polinske use his experience as a traffic violation attorney to help and put this entire incident behind you. Family law requires a personal touch that Polinske & Associates is able to provide. Whether you're going through a divorce, need to draw up a child custody agreement, want to establish a child support order, or even finalize an adoption in Illinois, our family law attorneys are here to help.